C series is designed with 5-point linkage outward toggle clamping mechanism, and linked with moveable platen at the central area to minimize its deformation while molding. Barrel temperature is controlled by PID+FUZZY mode with non-contact SSR relay. In addition, SCR constant temperature relay is optional for heating control to have temperature tolerance within 1C. For traditional barrel design, it's easily heating up to the setting data at nozzle portion as its smaller quantity. But, 2~3 times longer at other zones as bigger quantity, even worse at the ending zone due to cooling circuit surrounded. So, pyrolysis and silver mark are easily occurred as high temperature at nozzle portion for long time, even carbonized as well. Synchronized heating function could prevent resin inside nozzle from carbonization and badness. Mold with a wedge design is necessary for injection compression molding, and forced open around 2~3 mm, called compression stroke, while low pressure injection without any resin effusion between mold parting area. Mold clamping is actuated during injection, so hold pressure is provided by clamping unit instead of injection unit. The stress will be smoothly released accordingly, and the molded product will have a uniform density and remain stressless. The charging time is always much longer for heavier product. If mold cooling time is less, then simultaneous actions will effectively save molding cycle time and reduce the production cost as mold open, ejection and mold close can be actuated during charging. 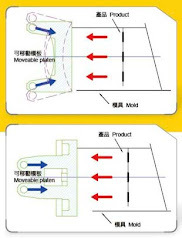 Minimize the deformation of molded product. Improve labeling character. Reduce clamping force. Improve the ejection character. Shorten cycle time. Promote air venting.